School teachers provide the essential instruction that kindergartners to high school seniors need to be successful in life. Whether teaching a 5-year-old to add single-digit numbers or delivering a lecture on supply and demand to an economics class filled with 18-year-olds, teachers play a critical role in transforming children into productive adults. 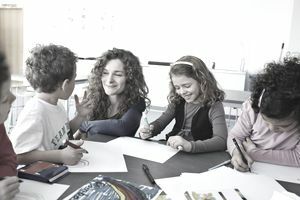 If you want to impact the lives of children and would enjoy having summers off, a career teaching school may be for you. The selection process for teachers varies by school district. The hiring process may include phone interviews, one-on-one interviews with a principal or assistant principal, panel interviews and teaching demonstrations. The ultimate hiring authority for teachers is usually the principal of the school where the open position resides. Applicants who receive job offers accept by signing an employment contract. The contract term can be as little as one academic year or as long as several years. All US states require public school teachers to have a bachelor’s degree and a teaching license. Teachers in private schools do not have to meet these requirements. Many teachers have education degrees; however, a specific field of study is not required. It works out nicely for those that did not know they wanted to be teachers while they were completing their undergraduate degree. To ensure that teachers know the subject matter they intend to teach, licensing tests measure their subject matter knowledge and classroom management skills. For people without education degrees, alternative certification programs prepare potential teachers for the licensing tests. Those who come to teaching with an education degree complete student teaching as part of their degree program. A student teacher shadows a teacher and performs various teaching tasks under the guidance of that teacher. Those without an education degree are unlikely to have student teaching experience. In the most basic sense, school teachers facilitate learning. Sounds simple, but it isn’t. Teachers must prepare lesson plans with specific learning objectives and an outline of how those objectives will be achieved. They must mitigate discipline problems while they execute the plan. And even if they skillfully execute a top-notch plan, there is no guarantee that students will succeed in accomplishing the plan’s learning objectives. When teachers have planned or unplanned absences from school, they leave the execution of the plan to substitute teachers. While many substitutes are skilled at what they do, the often to no accomplish the learning objectives because substitutes may be unfamiliar with the subject matter and often experience more discipline problems than the teacher. Discipline problems are a major source of frustration for teachers. If parents do not discipline their children at home, teachers are in for a rough time. A teacher can only do so much to mitigate discipline problems if parents are unwilling to partner with the teacher to impact a disruptive student’s behavioral change. Except for fine arts and physical education, elementary school teachers generally teach one set of students all their curriculum for an entire year. As students age, their lessons delve deeper into academic areas and thus require teachers to focus on one or a few subjects. By high school, students have a different teacher for each subject. According to the PayScale, the median wage for school teachers was around $43,000 to $50,000 in 2017. The bottom 10% of teachers earned salaries in the low $30s, and the top 10% earned in the upper $70s. Teachers can increase their salaries by taking on additional duties such as teaching summer school, coaching, sponsoring extracurricular activities and driving school buses. Some school districts pay teachers more if they have advanced academic degrees. Most school districts award salary increases based on tenure. School districts adopt salary scales and often write those scales into teachers’ employment contracts.